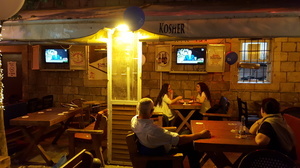 Like Yom haZikaron, Yom ha'Atzmaut (Israel's Independence Day) begins at sundown. In fact, as Israelis are always eager to explain, the transition between the two is intentional, signaling the connection between what they describe as military sacrifice and military victory. 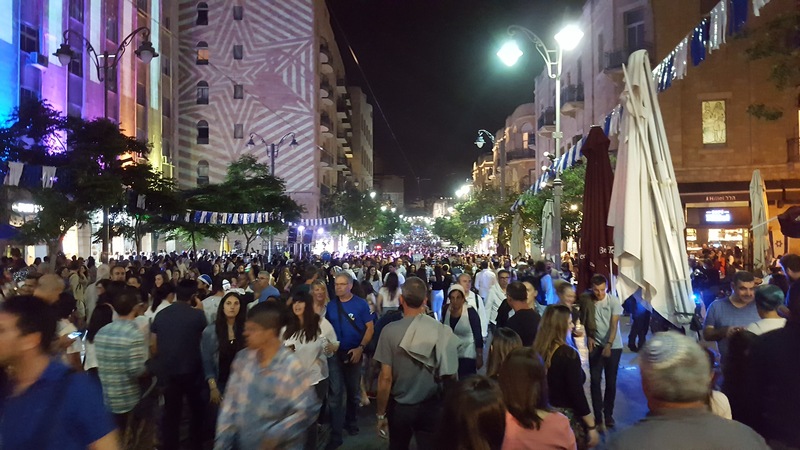 My experience on Yom ha'Atzmaut felt complicated, but I couldn't put my finger on what was bothering me until I talked to an Israeli who was originally from Germany. She said that she supported the celebration of independence, but that such blatant displays of nationalism felt uncomfortable for her. I agreed with her perspective, and added that the corresponding militarism also gives me pause. 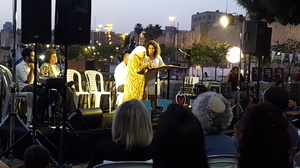 We began the evening at a non-nationalistic, non-militaristic ceremony commemorating the transition from Yom haZikaron. 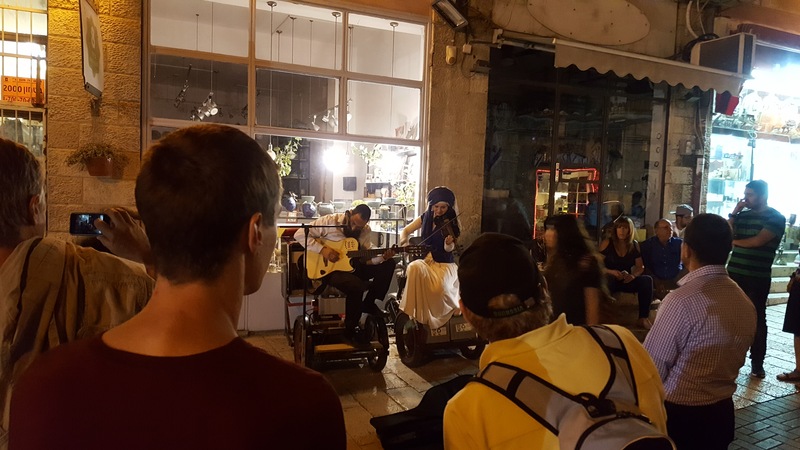 Put on by the Ein Prat Midrasha, a pluralistic beit midrash for young adults, it had previously featured some songs of mourning and remembrance, and a learning session about the holiday. Then, they brought up three graduates of their education program, each with a grandmother in tow. In turn, each grandmother talked about her original vision for Israel's future, at the time of its independence. Then, each grandchild discussed their own dreams for the next 70 years. It was incredibly moving, primarily because the pairs were really cute together, but also because Israel's story has become generational. A 70-year-old country is very different from a 30-year-old country, and it has the opportunity to address issues that may have been unrealistic or unattainable in earlier eras. The ceremony continued with songs, prayers, and poems, including one featured song written by a 7-year-old. In addition to being super-catchy, the song also raised interesting questions about Israel's past growth and future development. 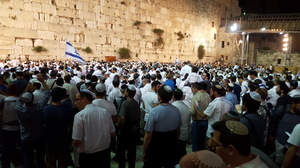 After a while, we moved on to the Western Wall, where a gigantic crowd of religious men were conducting a service honoring Israel's independence. The service itself was lively, and I was amused to see nearly as many bystanders recording the service on their smartphones as participants. There was a lot of enthusiastic singing, jumping, and celebrating on the men's side, though the women's side was much more subdued. Occasionally, the two sides would sing a song together. 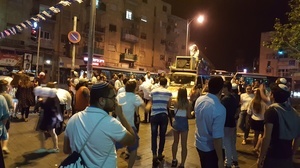 In the City Center, near Ben Yehuda Street, televisions were showing the official government ceremony, while people stood around waiting for the party to start. (We passed by several empty dance floors with loud music and disco lights.) Meanwhile, several street musicians were staging their own small celebrations, in a wide variety of styles. As the sun set, the dancing throughout the city center continued at the large main stage, several smaller stages, and around random speakers playing all types of music. 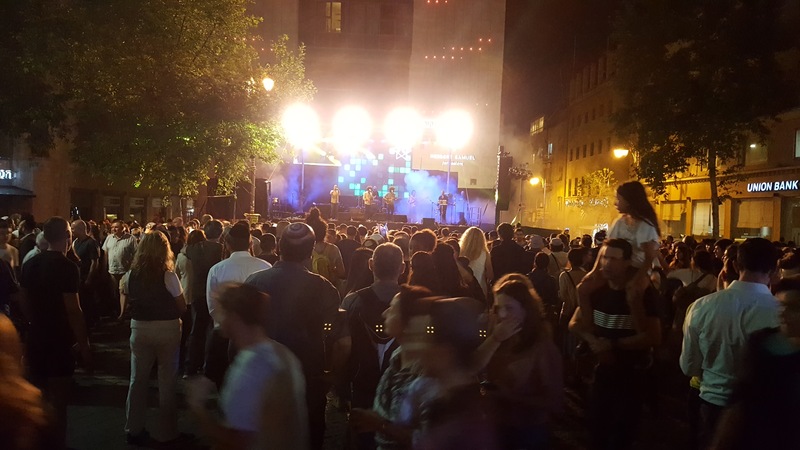 This particular stage was put on by BBYO's March of the Living organizers, and the musical style seemed geared toward teens, though adults of every age were actively dancing. This stage was on Jaffa Street, and the dance floor covered the entire street, including the Light Rail tracks. Everyone assumed that the Light Rail had been shut down for the evening, until the bell rang and the train drove straight through the crowd. I don't know if the dancers or the train passengers were more confused, but the dancing didn't stop just because of a train. 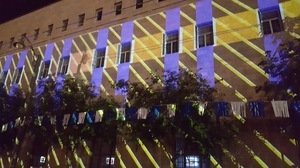 As we walked through the city, many of the building were illuminated with video projections in a city-wide art installation. 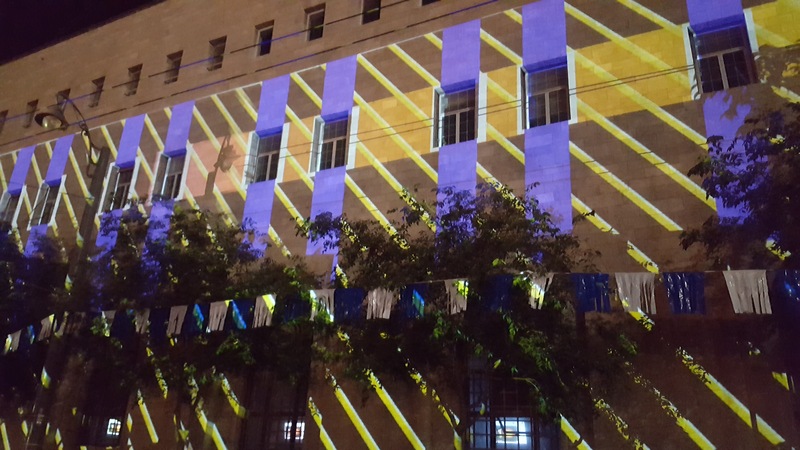 This building had pretty-colored geometric patterns, but several others had topical art featuring political messages or imagery of Israel's founders. The concert in Safra Square had a much different tone. The singers there were largely singing traditional Israeli folk songs, and old-fashioned rock favorites. (At one point, they even led the crowd in traditional Israeli dancing.) The audience here was older than in the City Center, but no less enthusiastic, especially during the songs with a good beat. 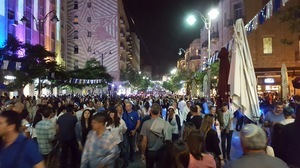 Back on Jaffa Street, the crowd was packed tightly through the entire City Center area. 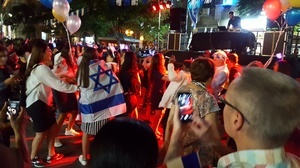 The stage at the end of Ben Yehuda Street now had a live funk band, and the plaza had become an enthusiastic dance floor. Even religious Israelis were getting in on the fun - one was singing through a loudspeaker on top of a van, and a very mixed group was dancing on the street in front of him. 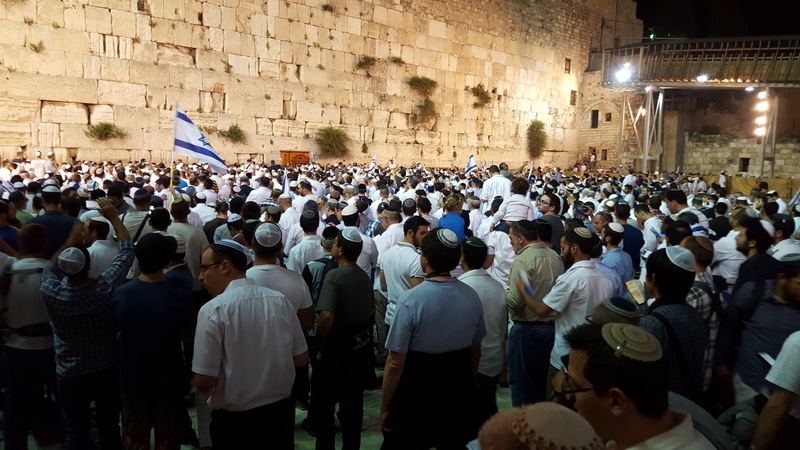 As we headed back after a long night, after seeing the full breadth of Jerusalem's Yom ha'Atzmaut celebration, we prepared to travel to Jerusalem in the morning for another side of the holiday.